It turns out the $10 I bid on a Fantasy Camp Training Week with SEC Football Officials paid off. That's right, I got to spend a "week in training" with the referees of the SEC. Oh boy! As soon as I indicated I was from South Carolina, I was promptly told to wait in the back of the line with guys from Vanderbilt and Kentucky. They said they were getting Alabama, Florida and LSU checked in first. I said, "Can't I register before the Ole Miss or Mississippi State guys?" The head of officials just shook his head and pointed to the back of the line. At the welcome meeting the emcee had everyone from Alabama stand up and made us all applaud for them. Then he said, "And the rest of you, thanks for coming." This morning we had a great speaker discuss in complete detail the fundamentals of how to make a call. First rule of SEC officiating is to know the teams' records of the game we are calling. 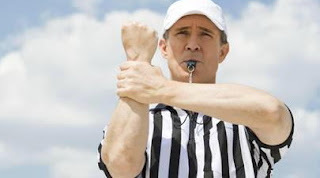 If we think there is a foul on a team, we reach for our flag and grab it, and have it "ready" to throw. Then we assess whether the team we are calling the foul against is undefeated, and if so, we wait two seconds. I will never forgive the coaches and I will never pay for another game ticket - ever. If South Carolina is obviously kicking the ball away from Watkins but he somehow still gets it, I will forgive the coaches, and will spend the following ten to twenty years praying for the constitution to attend another game at some point. 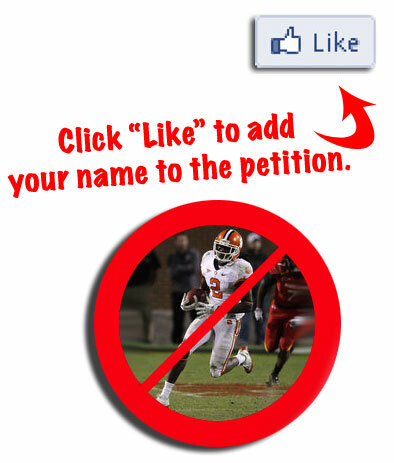 If we lose in a hard fought game in which we never kick the ball to Sammy Watkins, and it is obvious that we are actively trying to NOT kick it to Sammy Watkins, I will continue to support everything the University does whole-heartedly. If South Carolina accidentally kicks the ball to Sammy Watkins, it won't matter what I decide about attending a future game because my head will have exploded. But, PLEASE, Coaches, swallow your pride and don't kick the ball to Sammy Watkins. I would like to clarify something that has been brought to my attention about this blog post sounding, "scared." I am not scared of Sammy Watkins. I simply want to have our Gamecocks be in the best position possible to win the game using all the strategy at our disposal. "Wow, they were SO STUPID." Well, if we WILLINGLY give it to him, what does that make us? I think if we don't kick it to him, it makes us "NOT STUPID" as opposed to "scared." Please click the like button below if you agree! Nothing else to read on this blog post, just make sure to click LIKE on on the facebook page so your voice will be heard! Do that here. The football program's state right now is not what some fans would have hoped for at this point in the season. We just lost a fifth-year senior quarterback after losing to a completely sub-par opponent in Auburn. However, I am here to say that the football program is in much better shape than it could be had events 20 some odd years ago turned out differently. But before I outline all of that I have something else to say. I am officially banning one "commenter" from my blog website. It has been a few months coming now, but I felt like this was the right week to do it. This has been weighing on my chest, and I'm getting it off my chest right here today. 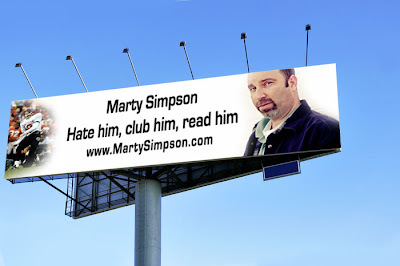 As all of you know I've got a negative guy over here who tries to hurt my personal blog website. He's got a right to do that. The criticism he shows me is okay. I don't mind that. I just don't like comments that are posted to my blog about me or my career that aren't true. That's the only thing I take exception to from a dedicated blog reader... is when they write stuff that isn't true. In 3 years as a blogger, I've had two comment-posters that I have had to disassociate with. The first had a handle name of "Grammar_Cock" and kept incessantly posting comments pointing out all of my split infinitives. When I realized "Grammar_Cock" was my mom, an English teacher of 25 years, I got her to start sending me private emails instead. To read the rest of this article click the image below or click here. Steve Spurrier was recently quoted saying he felt like the other teams may have successfully picked up some of the Gamecocks' offensive signals. "We have not done a very good job of hiding our signals," Spurrier said. "Sometimes when you call it at the line of scrimmage, you wait and see if the other guys are yelling something and they haven't been yelling anything. So we had two guys signaling last week." If Auburn does indeed have Spurrier's signals, the question becomes, how did it get them? I propose that it started at some point after the 2006 season. A special group of people were watching Spurrier's Gamecocks defeat the Florida Gators in 2005 and then almost beat them again in The Swamp in 2006 and decided that they must do something about it. This group of people were loyal to the Gators, but went out of their way to hate Spurrier. Who would fit such a description? Surely all Gator supporters would worship at the feet of Spurrier, right? Wrong. I believe there exists an Underground League of Ex-Spurrier Quarterbacks. They do everything they can to foil Spurrier's efforts now. Spurrier has made no apologies about how he handles his quarterbacks. Some of them have flourished under his "coaching to perfection" becoming Heisman Trophy winners, All-Americans and All-SEC performers. Others... have not. It is these "others" that concern me. Go to GamecockCentral.com to read the rest of this article.